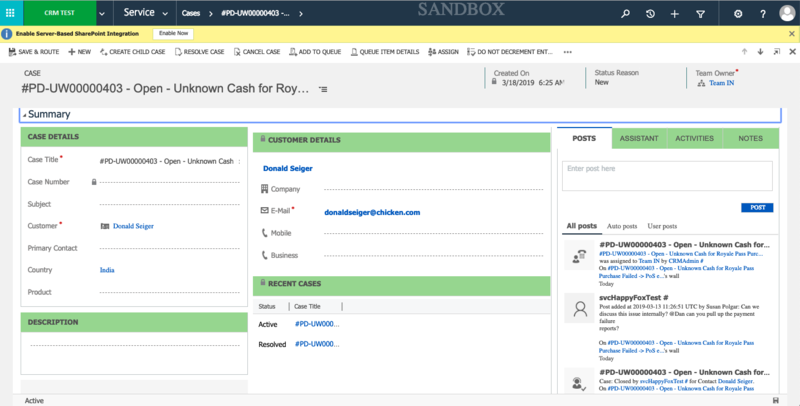 HappyFox integration with Microsoft Dynamics 365 lets you access your customer information from your HappyFox interface, and also allows you to view the tickets as cases in MS Dynamics interface. You would need an existing Dynamics 365 subscription to enable this integration. Microsoft Dynamics is one of the leading Customer Relationship Management software in the market that provides sales, service, and marketing capabilities. The cloud variant does not require customers to have their own servers running the application and is instead bought as a service from Microsoft (SaaS model). Microsoft Dynamics Online (2011 - 2015). Important Note❗️: These variants are listed as three different entities inside the HappyFox CRM apps page. Please cross-check your MS dynamics edition before installing the appropriate app. Heads up! This article covers in detail about the configuration steps for Microsoft Dynamics online / Microsoft Dynamics 365 (2016-present). Log in to HappyFox as an agent. MS Dynamics 365 account URL. Click here to know how to find your Dynamics URL. Click "Save". This Enables dynamics integration. 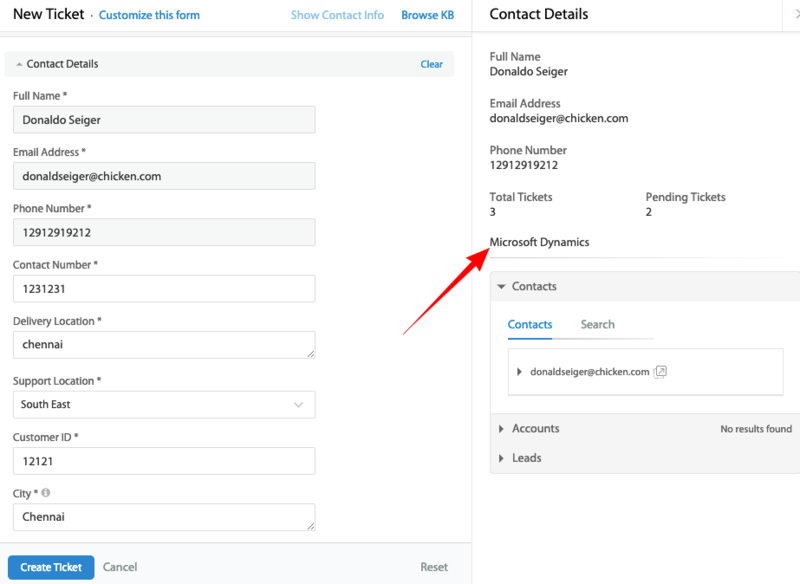 Choose the Contact, Lead and Account fields from MS Dynamics 16 that need to be shown in ticket-detail and new-ticket form. Go to Apps >> CRM >> Microsoft Dynamics 365 ( 2016 or later) (Skip this step if you're already on dynamics integrations page). Click "Manage". Scroll down to "Setup Fields" section. Click the checkbox adjacent to the respective MS dynamics field if you'd like them to be displayed as contextual contact/lead/account inside HappyFox. You can choose the order in which the fields need to be displayed by dragging selected fields. Once you're done, click "Save" towards the bottom of the page. You're done with the field visibility setup. Tip! HappyFox pulls up relevant contact, account and lead information based upon the e-mail address of the contact who've raised the ticket. Navigate to the "Search" tab inside MS dynamics integration module in the right sidebar. Search for leads/contacts/accounts depending on the subset. You will be presented with a list of search results matching the search term. Click "Compare" to get a side-by-side preview of all the search results, along with their respective fields. Click Create a new Account/Lead/Contact. Fill in the necessary details from the slide-in. Click "Create". This completes the new lead/contact/account creation process. Navigate to the desired ticket details page. In the MS dynamics integration section in the sidebar, you will be able to find the list of contacts/accounts/leads for the HappyFox contact. Choose to link a contact or an account with the HappyFox ticket by clicking the "Link" button adjacent to the contact/account. If a contact is linked, the ticket updates from HappyFox are pushed into Dynamics as "Service Cases" listed against the contact. If an account is linked, the ticket updates from HappyFox are pushed into Dynamics as "Service Cases" listed against the account. Warning ⚠️: You can link only one dynamics contact or account with your HappyFox ticket. Also, you cannot have a combination of contacts & accounts linked with a specific HappyFox ticket. Any change to HappyFox ticket status will correspondingly reflect in MS Dynamics as status reasons. Changes to HappyFox Status behavior i.e, Pending and Closed, will correspondingly reflect in MS Dynamics as resolved/ unresolved. Ticket ID and Subject form a part of the Case Subject inside MS Dynamics. Ticket content, replies, and private notes form a part of the "posts" linked to the corresponding dynamics case. Past HappyFox tickets linked against the Dynamics contact/account are shown under "Recent Cases" section inside dynamics. Only one CRM app can be active in your HappyFox account. If you would like to try out other CRM apps, you have to disable the MS Dynamics CRM app first. To temporarily disable the app, click "disable the app" link inside "Status".